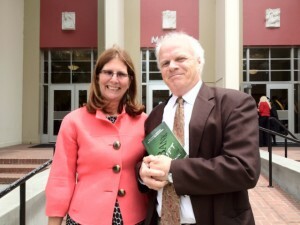 Veteran entrepreneur Carol Realini, pictured here with Chair Jon Pearce, assured computer science grads that tech's future remains bright (Carol Beattie photo). “Embrace change,” “dream big” and “pursue innovation” was the advice serial entrepreneur and alumna Carol Realini offered the Department of Computer Science Convocation May 25 at the Music Concert Hall. An expert in financial service innovation who has worked with including MasterCard and Citi, Realini assured grads (and their parents!) that the tech industry’s future remains vibrant, even in a down economy. So what path does she recommend? She encouraged grads to “leverage the valley,” “learn to be disciplined — and undisciplined,” “don’t let anyone say you’re not good enough” and “seek the bigger prize” by helping others.” Realini is a leading advocate of expanding mobile banking and payments to create financial inclusion in developing countries. You can read her speech on her blog.